The Newest Rant: DC Villains Month/Forever Evil--The Good, Bad, and Ugly Aspects of the Event. 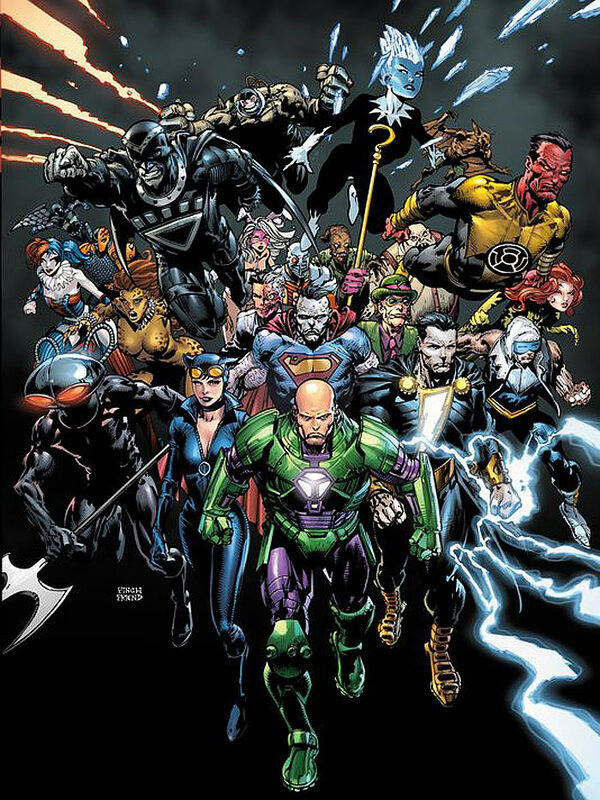 DC Villains Month/Forever Evil--The Good, Bad, and Ugly Aspects of the Event. It was rumored to be in the planning for some time (the website Bleeding Cool basically spilled the beans on it a year in advance), but some months ago DC finally officially announced it was happening. 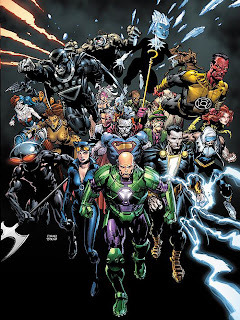 "Forever Evil" also known as "Villains Month" (inexplicably without an apostrophe) is a mega-event where for the entire month of October a variety of comics will be "taken over" by famous and not-so-famous bad-guys in the DC Universe. There are aspects to this event that are good, bad, and downright ugly. Let's break things down! Good: This is a "New 52" introduction or spotlighting for a variety of characters. With DC having a "New 52" some characters now are different in their appearance, origins, etc. While we have met some "evil" characters since the big re-boot/re-launch (Mr. Freeze got a whole annual in one of Batman's comics) there are plenty of folk who have not appeared much, or if they've appeared have been portrayed a certain way that would make hearing their "side of the story" useful. It might be good to see what Doomsday is like in this version of the DC Universe, and why not hear Black Manta's views when it comes to his quarrel with Aquaman? Bad: Do some of these characters need the attention? Who is this Trigon character? Also, while I've enjoyed reading about The Creeper in the past is he really special enough to have his "New 52" debut take up an entire issue? As much as I appreciate more minor characters like Clayface (whom is pretty interesting) getting some of the spotlight, I really don't know if we need to give Killer Frost that much attention. Then again there is probably someone out there who is thinking that Clayface doesn't need a comic and Killer Frost has been dying for her own issue, so I guess it all comes down to one's own personal preference. 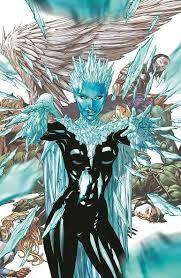 Plus, it isn't like I have to buy Killer Frost's comic. Do you need your whole own issue? Ugly: Honestly, these are basically fill-in issues. Look at who normally provides the writing and art for the series that have villains taking them over. Now look at the people providing the writing and art for these Villain issues. With a few exceptions things don't exactly match up, do they? Hell, there are comics that aren't even appearing/being "taken-over" this month such as "Batwoman" while meanwhile Batman's comics are taking up a ton of the event. I am pleased this gives the creative teams on "regular" titles some breathing room but in some ways this event is just one big month of fill-ins. Good: Events can be fun! Big comic-events can be exciting and fun! You have all these comics that loosely tie together and a main mini-series (in this case the "Forever Evil" comic) with big world-changing consequences (at least until the next event). Events can get people talking, stimulate sales, and otherwise sometimes result in cool stories. Bad: Events can be confusing for retailers and readers. 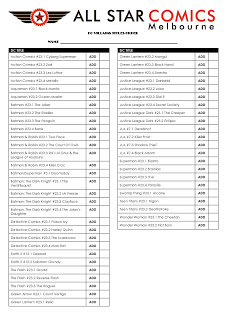 Due to the aforementioned fact that some comics aren't occurring for Villain's Month, and some have multiple issues (it is worth noting that despite this being "The New 52" there are more than 52 villain-comics) this is a nightmare for retailers when it comes to ordering what people want. For example, someone might read "Justice League" so they would be interested in the issue of that comic being taken over by Darkseid. However, there is also an issue of "Justice League" that is essentially an epilogue to the series "Dial H for Hero" that fans of the "Justice League" series probably have no interest in, but readers of "Dial H for Hero" would consider mandatory reading...but its labeled as a "Justice League" book with "Dial E for Evil" as what is taking over...so how is a retailer or reader supposed to figure this out? I've seen many stores realize that just pulling the books according to a customer's regular orders probably will not work out well, so a variety of retailers are giving out little sheets with all the titles listed and asking readers to mark what they want. That is a pretty good idea, but if DC had thought things out a bit better it maybe wouldn't have been necessary. Example of an order form from a store I've never visited. This way I don't seem to be recommending any store. Ugly: The numbering scheme is incredibly stupid. Remember how I mentioned some books aren't going to have an issue for this event and others have multiple villains "taking over" the same book? Well, DC is addressing the risk of possible numbering discrepancies by having all these "Villains Month" titles be numbered as .1, .2, and so forth. Therefore, "Aquaman" maybe has a .1 and .2 issue for both Black Manta and Ocean Master, while some Batman books go up to .4 due to all the villains. This seems like an idea that works at first, but actually is incredibly stupid and convoluted. I hated marvel doing all their ".1" issues that were supposed to serve as easy jumping-on points for series, but usually ended up being fill-in issues (hmmm, I see a trend here), so I wonder what the reasoning was behind DC looking at that failure and then saying, "Hey, we should try that too!" Everything would be so much better if instead of doing this .1, .2, etc. business they just made each villains book a "#1". Therefore we would have "Lex Luthor #1" instead of "Action Comic #23.3". That would make sense though, and when was the last time a big comic-book company did something that made sense? 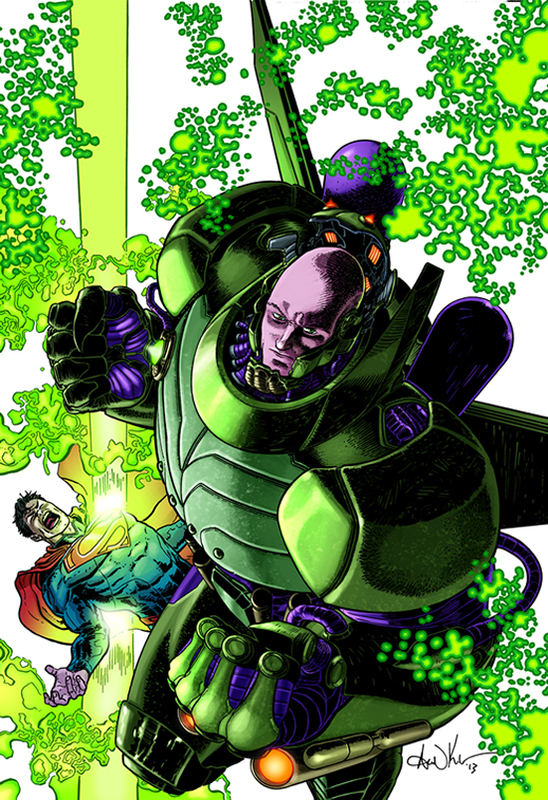 "Lex Luthor #1" is so much better? Good: DC waited awhile to do a mega-event like this so it seems bit more important. There are times when folk begin getting event-fatigue. It starts to feel like one big world-changing event simply leads into the next, and that leads into the next, and so on in one never-ending cycle of mindlessness. To DC's credit this is the first gigantic line-wide event they've done since Flashpoint and that event's leading into the re-launch (which was itself basically a big event). While there have been cross-overs between some comics, nothing as big as this has occurred, making it feel just that little bit more important. Bad: Won't a smaller event, Trinity War, have just happened? Even though DC hasn't done a huge event since they became the "New 52" there are in the midst of a smaller cross-over event called "Trinity War" which is affecting the "Justice League" titles a few others. While "Trinity War" may not be a gigantic event, it is likely it is going to lead into "Forever Evil" and the "Villains Month" titles, which starts to create that aforementioned appearance of events leading into events. The Ugliest Thing of All: Every comic is seriously $3.99 for a gimmicky cover. Every comic is $3.99 for not really many more pages, but these stupid little pseudo-3D gimmick covers. This whole gimmick-cover trend (and alternate "collectible covers")is basically what brought the comics' industry down to its knees in the 1990's and to see DC do it with every one of their "Villains Month" comics is just horrible. 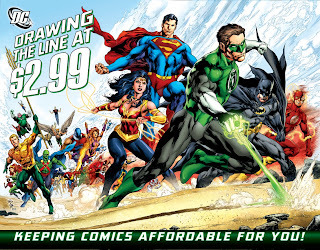 I remember when not long ago DC bragged about how they were "Drawing the Line at $2.99" and that seems to be a statement which basically has flown out the window. I would not be surprised if when some of these comics return to their "normal" states that we see a $3.99 price tag remain for little supposed "bonuses" outside of maybe a page or two (or some sketch-pages)--which in my book does not equal paying a whole dollar extra. Remember when you said this, DC? I bet you wish we didn't. The cost of buying every single one of the "Villains Month" comics along with the first issue of the "Forever Evil" mini-series is immense due to that extra dollar (and the large number of comics in general), and price is one of the major reasons there are quite a few books I'm skipping. I guess if I really wanted to protest this I wouldn't buy any of the comics, but I don't know if that would send as much of a message as only buying some of the comics, because if more folk do that DC will see that raising prices causes them to actually lose money as people buy less books. I guess we won't know if the good, bad, or ugly win out in "Villains Month", but I hope that we get more good comics than bad (or ugly). I also want this whole event to not just feel like one big fill-in issue. 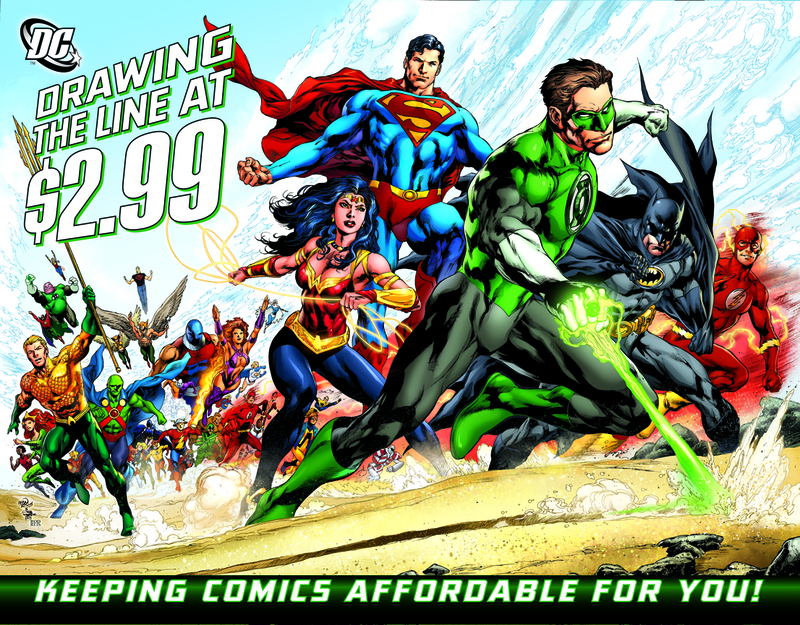 Plus, I really, really hope that DC doesn't use this as a springboard to raise the price on a bunch of their comics. We will see what happens, I suppose.